2018 was such a great year for music, for me personally. Many of the artists i mentioned above were artists that i didn't think too highly of before, and all of them came out with fantastic records this year. I previously struggled with Death Grips, and this time i completely fell in love with the new record. It's pretty much like that with the others, except for The Voidz (I have always enjoyed anything Julian Casablancas makes), A.A.L. and Sons of Kemet. Also, shoutouts to JPEGMAFIA's Veteran, Kids See Ghosts' self titled, Daughters' You Won't Get What You Want and Brockhampton's iridescence. To be perfectly honest I only really enjoyed the first nine on there, but I can't just do a top nine and leave it uneven, so insert Noname. I really like that Noname has her own unique style -- and I think her production is really great -- I just don't enjoy the sound of said style. Three albums from artists I enjoy came out last Friday. Whew! Deerhunter over here quietly dropping an album of the year contender in January. I was reading an interview with Bradford Cox before the record released where he touched on some interesting subjects - how he believes nostalgia hinders us as people, how this album isn't as introspective as their others, and his views on the various forms of escapism. While I don't necessarily agree with all of his viewpoints, he's always had an interesting perspective on life and that shines through on every Deerhunter release. My only complaint about this album is its length - my favorite Deerhunter moments are long and drawn out, exploring every corner of a sound. Here, we're given ten tracks and none of them are especially long. Still, it's lush and varied, worth many listens in the future. Speaking of album of the year contenders.... James Blake comes out swinging with his usual moody, experimental, slightly hip-hop influenced record. I've always loved how he's intertwined some somber piano melodies into his work and with collaborators like Andre 3000 on here, it really elevates things to a whole new level. With Blake, I usually enjoy a handful of songs on an album but not the entire thing. Luckily, this breaks that streak for me. Toro y Moi's first three albums are extremely close to what I'd consider perfection, especially Underneath the Pine. After that, I've been becoming less interested with each new release and his last work (Boo Boo) felt like it didn't even have a pulse. When Freelance dropped as a single, I was immediately hooked and ready for what this album would bring. Unfortunately, there's about two or three songs that are real bangers and the rest feels like something a failing radio station might play at 3 am. I can't fault Chaz for trying new styles all the time but a lot of this record just lacks a heart for me. Listen to Ordinary Pleasure and Freelance though, those are great. Foals announced they'll be releasing two albums this year, Broken Social Scene has a record coming out as well. 2019 is a beast in the music world so far. Stumbled upon this thanks to Youtube recommendations, this is pretty sick. @bam541 That's crazy, she just got announced to play in my city in May. @sabotagethetruth Nice. I would love to see her play, checked out her other songs and it's pretty cool. Sonic Mania's Stardust Speedway Zone 2 music reminded me of this. Absolute banger. I've really been feeling Modest Mouse lately, so I decided to go back and listen to a few of their albums. I started with my favorite from them, The Moon & Antarctica. It's very mellow (mostly) like the albums that proceeded it, but there's some nice production techniques like strings that really tie the whole thing together. There's also some tracks (The Stars Are Projectors, for instance) that are just dense and sprawling and create soundscapes that were absent in their earlier works. I will say though, this is the first time I feel like the back half of the album is a little weaker than the first half. It's still my go to Modest Mouse record though by far. Iglooghost's Clear Tamei & Steel Mogu. Clear Tamei feels... classical, and has pleasant moments, while Steel Mogu is energetic and violent, rushing at high speeds to hit you. Both are amazing, can't pick which one's better. Aphex Twin's Collapse. It's like being in VR and seeing the digital world around you collapse wink, producing frantic, otherworldly and inorganic sounds. It's also amazing, might be my favorite among the three. LCD Soundsystem's new live album, Electric Lady Sessions is awesome. It's mostly live renditions of their songs (mostly from american dream), with some covers. The performances are great for the most part, great song selections too. I really loved every song here except for Home, this version's first few minutes kinda weirded me out a bit. Ought's Sun Coming Down. Man, this is so fun to listen to! It's quirky and ridiculous, thanks to the absurdly good vocal performance. The band always tries to change things up a bit, and it's executed flawlessly. I have all the songs stuck in my head at some point. I can see this being one of my favorites ever, only time will tell. Protomartyr's Relatives In Descent. Also a post-punk album, and also a good listen. It sounds way more serious, can be menacing at times, and is overall a very moody record. Some parts are a bit too slow and/or too long, but it makes it up with how atmospheric and badass it can be. Remo Drive's Greatest Hits. No, it's not a compilation album, it's the name of their debut album, and it's a really catchy and fun emo indie rock record. It has classic emo lyrics that isn't cringe-worthy for the most part, and the perfect vocalist voice that fits the tone of the album. I'm mostly impressed by the energetic and dynamic instrumentation, they really help build the tone of the album and keep it fresh throughout. There's some dumb moments that keep me away from fully enjoying it though. Japanese Breakfast's Soft Sounds from Another Planet. I think i talked about this band's previous album before, and how boring it was. Well, this is the complete opposite. It has lots of beautiful, spacey instrumentation mixed with soft, yet strong vocals. It's not very consistent in quality, and some parts can be a bit too soft, but it's still a good album overall. I also listened to Toro y Moi's latest record, which was already talked about. It's my first Toro album, and i enjoyed it. First three songs and Freelance is amazing, the rest can range from decent to boring. Still enjoyed it though. I plan to listen to his older stuff soon, along with exploring 2 other bands that I haven't listened to before. The only problem with City Pop is that it was most popular in the 80s, so much of it sounds incredibly outdated. Hell, Lamp might not even fit but I like it enough to include it anyway. Listened to Kid Bloom's A Different State of Mind EP. I stumbled upon one of the EP's song on Youtube a while back, and I only got around to the whole EP yesterday. It's a really groovy lo-fi indie rock, with a good amount of style and confidence. Loved all of it's 13 minutes runtime. The first song's my favorite, can't get enough of that guitar. One of my favorite R&B groups. 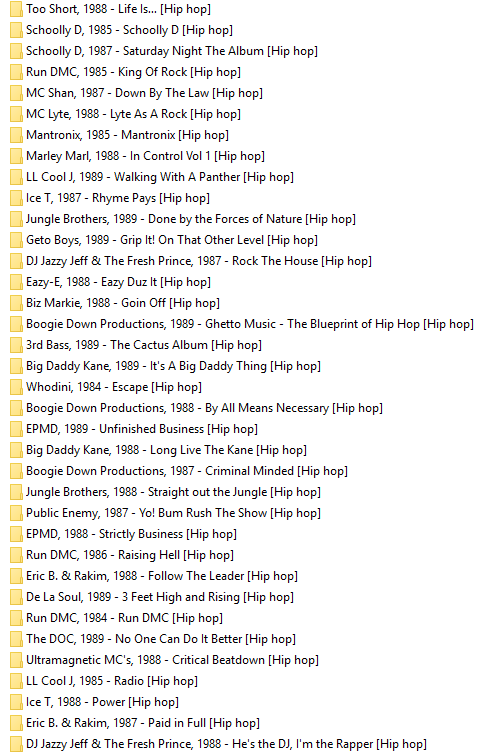 Spent the last couple of days discovering '80s hip hop. Found more than a few GTA San Andreas songs. I recently started listening to Nujabes (thanks Fantano), and damn he's a really good producer. He has made some of the best hip hop beats I've ever heard. Also he apparently did the soundtrack for Samurai Champloo, which explains why it is so good. Gone too soon. Listened to They Might Be Giants' self titled debut album. It used to be tradition of mine to start with the first albums of older artists (and go wherever from there), and I glad i did it again with this one. It's a fun listen, very playful, and successfully humorous. Instrumentally solid too, although it can sound a bit too samey and skeletal sometimes. Did the same thing with Death Cab for Cutie and Talking Heads. Something About Airplanes (Death Cab's album) is decent, a lot of songs here i don't care about but the rest of em' are pretty great so it's quite half-and-half for me. Talking Head's 77 is endearing and eccentric. I really enjoy the singer's style. Don't really know where to go from here with these bands, so I might just go straight to their most popular albums. @bam541 Transatlanticism is the essential Death Cab album. I'm a big fan of The Photo Album and We Have The Facts And We're Voting Yes as well. While Something About Airplanes is their first release as a full band, the true first release is You Can Play These Songs With Chords, which is just Ben Gibbard by himself as Death Cab For Cutie. It has a few of the same tracks as Something About Airplanes but (in my opinion) better cuts of those tracks. I'd avoid anything from Codes & Keys and later though - they just sound bland at that point.